PottstownJudo.com : Home of the Pottstown Judo Club! Our Judo Uniforms of Choice! Pottstown Judo, Helping Support your Homeschool PE Needs! Or Contact Us if you want more information about the judo class itself! We are a proud and long standing program of the Pottstown Parks and Recreation Department and a 501(c)(3), Non-for-Profit club. Why pay a fortune for a quality martial arts education? Help support your LOCAL recreation programs! Please contact us if your have any questions. Classes Mondays & Thursdays, Ages 8 to 12 6:15pm, 13+ to Adult 7:00pm. Visitors welcome. 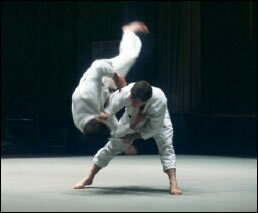 Many people ask, What is judo? So here's a short promotional video by the Kyoto Judo Team, Japan. On behalf of the staff of the Pottstown Judo Club, and Pottstown Parks and Recreation we welcome you and hope you enjoy the site. Our classes are designed to teach both the fundamental and advanced techniques of Self-Defense and Sport Judo in a safe and supportive learning environment. We place great emphasis on the safe and proper application of judos' throwing and grappling techniques, as well as establishing discipline and self-confidence in people of all ages. It is a fact that kids (people) who participate in a martial art generally do better in school (work), are more self-confident, and have better self-esteem and more self-confidence in there abilities to achieve higher goals in life. Our advanced students routinely participate in local, regional and national tournaments. We welcome beginners to sign up at the start of any session, or simply stop in and watch during normal class times. Judo is a great physical activity that the whole family can enjoy individually or together! Our staff of instructors are nationally certified coaches with a combined teaching experience of over 50 years. We are a proud and long standing program of the Pottstown Parks and Recreation Department and a 501(c)(3) non-for-profit club. 11 Reasons Why Martial Arts Are Better For Your Kids Than Team Sports! 10 Things You Should Know About Your Judo Teacher! Judo is an official Olympic Sport and an official Paralympic event (for the blind)! Almost every Nation belonging to the United Nations has a judo team…and in terms of volume judo is second only to soccer on the global scale. The American College of Sports Medicine, says JUDO is the safest contact sport for children under the age of 13 played in the United States. Judo has been practiced by Police in Japan since 1886. US President, Theodore Roosevelt became a Brown Belt in judo during his administration and built a small dojo in the White House. Russian President, Vladimir Putin, is a 6th Degree Black Belt in judo. Jigaro Kano (founder of judo) was the inventor of the Kyu - Dan grading and belt color system, that soon got adapted by other martial arts such as karate. Judo is a martial art founded in 1882 by Dr. Jigoro Kano and is derived from the ancient Japanese art of Ju-jitsu. 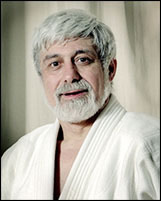 Dr. Kano, President of the University of Education, Tokyo, having studied Ju-jitsu in his younger years, combined many of it's techniques and principles, and minus some of Ju-jitsu's more dangerous techniques into what he called "JUDO", which literally means "Gentle Way" also translated as "Yielding Way" or "The Way of Gentleness". Judo is an official Olympic sport; it was added in 1964, when Tokyo played host to The Games. Judo as a Paralympic event was added in 1988. Paralympic Judo events are for visually impaired contestants and the rules only very slightly from normal Olympic Judo. Many Special Forces, Military and Police Forces around the world include judo, along with other martial arts in there training to keep them safe. Judo has been practiced by police in Japan since 1886 when the Tokyo Police Department sponsored a competition between the then new Kodokan Judo School and older Ju-jitsu schools. There's even a judo kata form for it… "Renkoho Waza" - Judo Arresting Techniques. 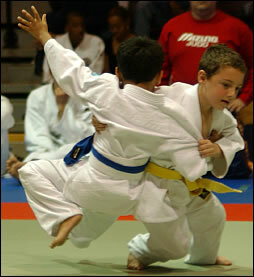 Did you know that judo, along with other grappling martial arts are the most taught to the visually disabled? Judo is one of the few competitive sports that the visually impaired athlete can participate in fully without major accommodations. Blind athlete can attain a special sense of satisfaction from participating on an equal basis with sighted individuals. In competition, both "Shiai" (tournament) and "Kata" (forms), blind athletes have achieved great success against top sighted and non-sighted competitors. World class competition for male blind athletes has been available since the mid-80's when the International Blind Sports Association (IBSA) accepted judo as a Paralympic Sport and for women beginning in 1995. Today, opportunities exist for Local, Regional, National and International competition and training camps specifically for blind judo athletes. Pottstown Judo will graciously accept the attendance of visually impaired or blind students. Please contact one of our instructors if you are interested!